Finally, one of the most popular sale windows of the year is here! If you are considering to buy a plugin, and waiting for a sale, this is the right time. 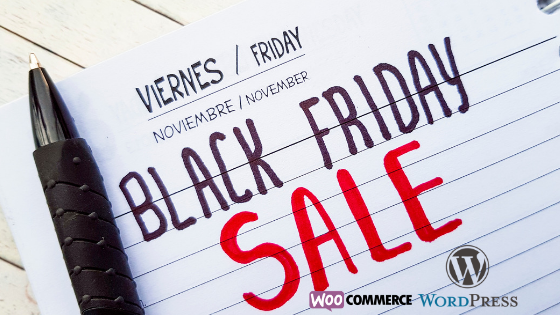 Here is a compilation of some of the great Black Friday deals on WordPress WooCommerce plugins and tools. If you are wondering how to set up a Black Friday deal on your WooCommerce store, here is an article that can help. On the WooCommerce site, you will find a 30% discount on everything until 26th November Midnight PST (Pacific Standard Time). Please note, the offer is valid only on new purchases, and not for renewals. Find the Sales Page here. You will find reliable WordPress maintenance services from the expert team of WP Buffs. You can stop worrying about continuous uptime, security, performance and updates on your WordPress site or WooCommerce store. The service is quite transparent, and you find all the details of changes in the detailed reports. You will get 10% off on all their monthly plans this Black Friday. CometChat is a real-time chat plugin which enables user to user communication in your website/app through voice, video and text chat! It readily integrates with over 92+ platforms including WordPress and comes with in-built monetization, moderation, collaboration, and administration tools. With over 50,000+ users, CometChat is the most sought-after chat solution for adding real-time messaging – voice, video & text chat to any website or application. CometChat is a unique solution for real time chat on your WooCommerce store. This Black Friday, use the below code and get a flat 50% off on all plans for the first two months! Offer is valid from 21st Nov – 26th Nov.
MemberPress is one of the most popular WordPress membership plugins. You will be able to restrict access to pages, posts, custom post types, categories, tags and a lot of other files existing in your WordPress installation. It will also help you build community forums and is compatible with several WordPress forum plugins. Moreover, you can geenrate unlimited coupons on your site with the help of MemberPress. It works seamlessly with any theme and offers great reporting features as well. Check out some of the popular WordPress plugins to restrict content in our other article. You will find a range of high quality WordPress plugins on Barn2Media. With their plugins powering over 5000 WordPress sites across the globe, this team from UK, is an expert bunch. 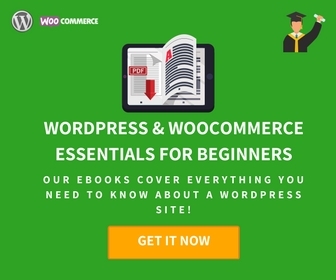 They are behind the bestselling WooCommerce Product Table plugin, Posts Table Pro and the popular WooCommerce Protected Categories plugin. Get 50% off any of Barn2 Media’s plugins between 23-26 November by entering coupon code BARN2CYBER2018 at the checkout. This is one of the most popular options to create a WooCommerce order form that lists out products. With over three million customers, Template Monster is a huge presence in the field of web design and development. Find everything for your website with 50% Discounts on TemplateMonster Marketplace: WooCommerce themes, Elementor & WordPress themes, plugins and graphics for any taste. Flycart is a team that develops quality WooCommerce extensions in the pricing domain. You will find all their plugins feature rich and with user-friendly interfaces. Moreover, they offers dedicated support on all their premium products. 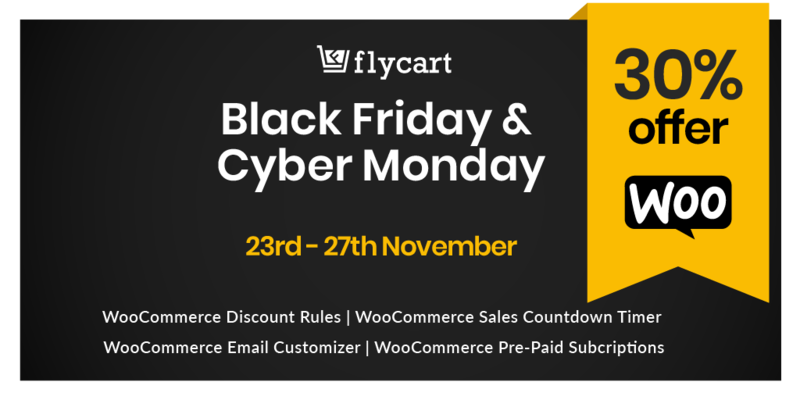 This Black Friday, Flycart offers 30% discount on some of their premium plugins. Edwiser is a leading provider of solutions for the e-learning industry. If you are creating courses in Moodle, you will find a range of solutions from Edwiser to enhance your experience. Edwiser Bridge will help you integrate Moodle with your WordPress site. That way, you will be able to sell Moodle courses on your WordPress site. Another interesting product of Edwiser is the user-centric Moodle theme RemUI. On Black Friday, get 10% discount on all of the Edwiser products. Edwiser offers products to enhance your experience with the e-learning platform Moodle. Tyche Softwares offers a range of useful plugins for WooCommerce store owners. 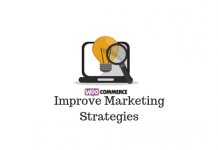 There are several solutions that will help to enhance your sales as well as improving the functionality of your WooCommerce store. Some of the popular tools that you can purchase on the Tyche Softwares website includes the Booking and Appointment Plugin, Abandoned Cart Pro, Order Delivery Date, etc. Their Black Friday Sale is live now and will be open for 9 days. Get 35% off on all their plugins & bundles. 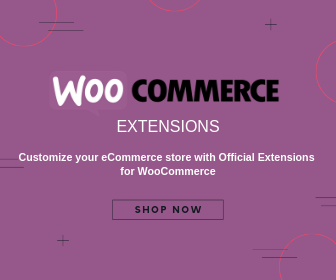 You will find a range of great WooCommerce extensions on Tyche Softwares. 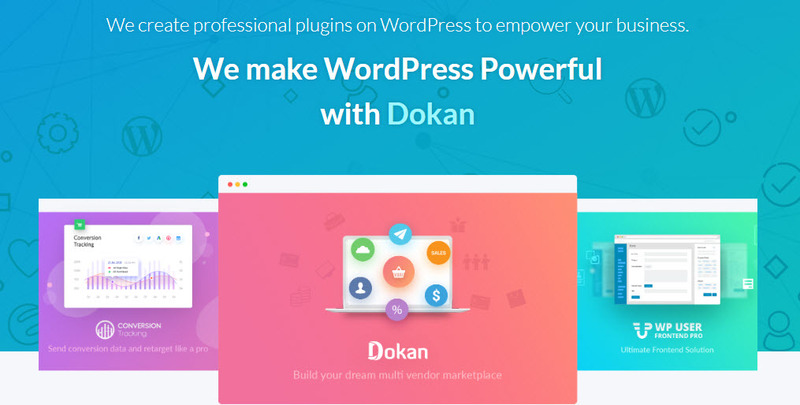 weDevs offers a range of powerful eCommerce solutions including the popular multivendor plugin Dokan. These plugins should help you speed up your business functions, and boost overall productivity of your team. 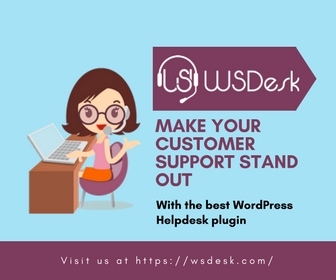 They have a team of WordPress enthusiasts who will offer great support for your eCommerce site. With their Black Friday Offer, you will get 33% discount on all their products. weDevs offers a range of powerful extensions to enhance your WooCommerce functionalities. You will find a range of free and premium WordPress plugins with Solwin Infotech. All these plugins come with dedicated support and regular updates. Their premium plugins are responsive and will work smoothly on all devices. With simple configuration and great user interface, these plugins are capable to reduce your workload as a WooCommerce store owner. Moreover, you will find extensive documentation for all their products and will be able to clarify queries yourself. Solwin Infotech offers plugins with diverse functionalities that will help you manage your site better. With Solwin Infotech’s Black Friday and Cyber Monday sale, they are offering flat 50% discount on all their products. Coupon will auto apply during checkout. OceanWP is a popular WordPress theme used by several top companies across the globe. It has a very friendly user interface that helps you import one of the many demos in a single click. You will be able to create a fast, responsive eCommerce ready website in a matter of minutes. The theme has built-in SEO and is translation ready as well. To celebrate Black Friday, OceanWP is offering 50% OFF for all this week on any plan of the bundle. OceanWP is a preferred theme for several WordPress developers as well as hobbyists. ThemeIsle offers a range of WordPress themes that are loved by their users. They offer great design, simple user interface and a quick updates. Some of the popular companies in the WordPress and technology domain use their themes. All their products are easy to customize and offers brilliant user interface. More than 30 premium themes and 7 pro plugins are available in their bundles. This Black Friday, you can save 30% on first year memberships with ThemeIsle products. ThemeIsle offers a great range of WordPress themes and plugins. Themify offers a great range of WordPress themes and plugins. They have a WordPress toolkit that includes all Themify themes and plugins, which can be great for your WordPress site. This Black Friday, Themify is offering a $75 discount on their lifetime MasterClub membership. It’s a great chance for WordPress site owners to get products individually as well with a 40% discount on all purchases. 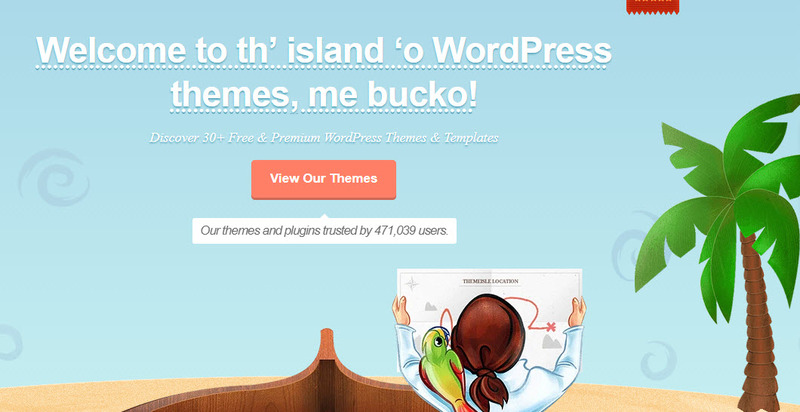 Themify offers some great themes and plugins for your WordPress website. Use code: BLACKFRIDAY or BFLIFE75 for $75 off Lifetime Club + Giveaways! You will find a range of premium WordPress themes and plugins with MyThemeshop. Their plugins would help to make your site load really fast, and they all feature responsive designs. Narrated video tutorials and round the clock support would make it especially easy for you to use their products. You can buy their products once and use for lifetime. For Black Friday, they have a great offer, where you can purchase their Extended Membership at $99.47. This will include 18 premium plugins, more than hundred themes and 20 domain licenses. 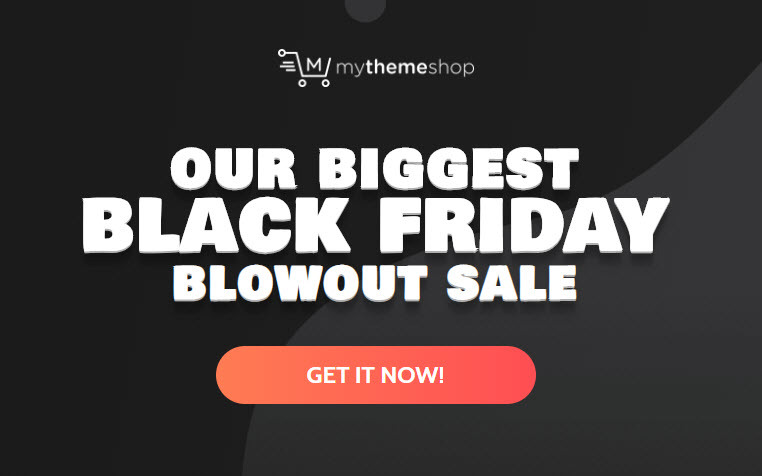 Buy the MyThemeshop Extended Membership at 99% off! Getting the right hosting provider is exceptionally important for any WooCommerce store. Cloudways ensures top notch customer service and a superior performance for your site throughout. With five cloud provider, unlimited application and innovative control panel, Cloudways can really help to boost your business. This Black Friday, you will get 30% discount for 3 months on all their plans. Hostinger is another great hosting service provider that offers unlimited disk space, bandwidth & dedicated live Support. They guarantee almost uninterrupted up time for your site. With a powerful control panel and superior performance, Hostinger is a great option to host a WordPress site. With their premium and business web hosting plans, you will get a domain free of cost as well. This Black Friday, they are offering deals of up to 90% on web hosting, and you will get a free domain. Hostinger offers a great range of options for web hosting along with free domain name. Checkout their site to know more about the deal. You will find a wide range of hosting plans on A2Hosting. Their industry leading solutions are suitable equally for experts as well as new users. They have optimized setting for most of the popular content management systems including WordPress. With 20 times faster servers, uninterrupted up time, free account migration, free SSL certificate, etc., A2Hosting will be a great option for your WordPress site or WooCommerce store. A2Hosting offers a range of hosting plans that suits varied requirements. Through their Black Friday Sale, get upto 67% off on their various hosting plans. Hostgator provides great web hosting services globally. Irrespective of your knowledge level, you will find their solutions suitable to host your WordPress site. With localized technology and round the clock support, you will find an exceptional experience when you choose one of the plans of Hostgator. For Black Friday, there are deals on their hosting plans with up to 50% off. 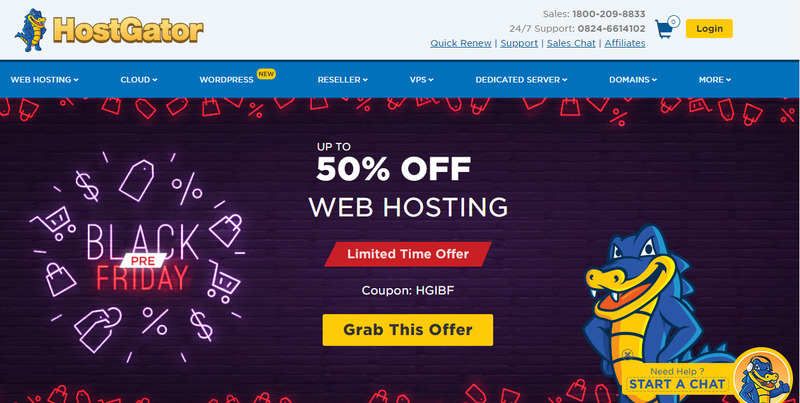 With dependable support and superior features, HostGator has become a popular choice of hosting for several WordPress sites. Hope you will find a great WordPress plugin or service from the above list! You can also checkout some of the ongoing deals on our Deals page as well. Next articleHow to Add Web Push Notifications to Your WordPress Site?